Learn the basics of windsurfing with the professionals during this fantastic experience in East Sussex. Ideal for beginners, you'll be amazed at how far you progress at this awesome water-sport. Windsurfing is a fantastically enjoyable watersport: it is both thrilling and challenging, and offers something for everyone, whether it is light wind cruising, high speed blasting, or huge soaring jumps! Learning to Windsurfing is much easier than you think, and you are sure to have a blast whilst doing so; with the introduction of modern equipment and innovative training techniques it is now easier to pick up than ever. If you've always fancied cruising along the water and riding waves like a pro, then this is the perfect taster for you. 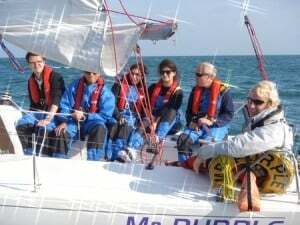 Consisting of a one hour private tuition with a knowledegable instructor and one hour of personal use, you'll be amazed at how far you come; it's perfectly realistic to expect that you will be sailing across the lake by the end of the lesson. Great fun for all.Upon arrival at the centre your instructor will meet you and get you kitted out in your wetsuit. You will then be introduced to the equipment before doing some work on dry land with a simulator. It's now time to hit the water, under the watchful eye of your instructor who will constantly provide tips and advice to make your progress as fast as possible. This two hour introduction will give you an excellent insight to the exciting world of windsurfing and give you a real feel for the sport. You can realistically expect to be sailing by the end of your session which will leave you ready to come back and give it another go in order to learn some further techniques. Discover Windsurfing is available on selected dates throughout the year, with most centres closing between November to April. Age requirements: Min age 8 in most locations. Under 18's Must be accompanied by a responsible adult. All participants must be confident in the water and able to swim. This experience will last approx 2 hours. The first hour will consist of a private tuition. The second hour will be for recreational use. Participants: The Windsurfing Experience in East Sussex is for 1 participant. Spectators are welcome at most centres, please confirm with the centre when booking. In Brighton, this session is a one hour private tuition followed by 1 hour of recreational use. All others are in small groups. The centre will provide you with a wetsuit and buoyancy aid etc. You will need to bring a swimming costume and towel. Also, if it is hot take some sun block and if it's not take some warm clothes to change into afterwards. This activity is weather dependent please contact the centre before you set off for the day. At Experience Days we are excited to provide you an exclusive interview about the roots and future of Lagoon Watersports in Brighton with one of the founders- Harvery Dawkins. Lagoon Watersports offers a wide range of exciting Watersports such as: Wakeboarding, Kayaking, Sailing and SUPing which can be found via our webpage here. 1) Please explain a bit of background on Lagoon Watersports and the different activities you offer. My initial passion was for windsurfing, in particular wave sailing. This passion led to the development of my love for being on and in the water as much as possible. So with my business partner and friend Seb Rouse we started the business in 1994 with just 6 windsurf boards and it grew from there. The increasing popularity of the business meant we began to expand – introducing sailing and kayaking. Seb is a very keen sailor and so specializes in the sailing side- the yachts and powerboats, opening our big boat-sailing and power boating centre in Brighton Marina whereas I manage the centre in Hove Lagoon. Lagoon Watersports offers a variety of exhilarating water activities including: Wakeboarding, Windsurfing, Kayaking and Dinghy Sailing which is brilliantly run by our team of up to 40 employees (during peak season). Since the centres’ opening in 2001, the thrilling Zap Cat powerboats immediately became a very popular extreme power boating experience, but personally I prefer a more rustic approach and enjoy the sail and human power rather than the engines. Wakeboarding has been a sport the staff and I have always been keen on; however it tends to be impractical and expensive due to internal and external factors such as an appropriate boat, driver and a calm sea. But as soon as the new generation of straight line wakeboard cable systems arrived we knew that this was the way to go and invested to become the South Coast’s first cable Wakeboard Park. In the last couple of years, the standup paddle boarding scheme has exploded and this is something I love. It is so accessible yet has the diversity to make the sport as challenging and extreme as you like. 2) How did your passion in watersports turn into a career? I wanted to go windsurfing when it was windy not when my boss said I could, which was often enough. I just wanted to be completely independent in what I loved to do. Obviously the reality is very different and there’s a lot of hours involved but throughout the years I’ve managed to do a lot of windsurfing, SUPing and wake boarding so it has pretty much worked out as planned. 3) Do you have any exclusive information you can share with us? We are finding more and more people want to get onto the water. When people visit or even residents of Brighton, everyone wants that connection with the water, it makes you feel good. A recent trend that we are delighted to see seems to be that more and more people are looking for health activities that are more interactive to do outside of the gym, and that is what Lagoon Watersports offers. To coincide with this, we have been adding new classes like SUP yoga, SUP race training, coastal sailing cruises and more advanced training courses to help customers stimulate their passion and reach that next level. 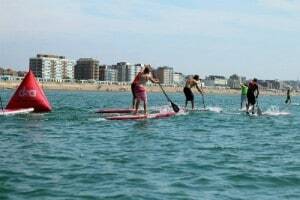 Also look out for SUPing (Standup paddleboarding) it’s the next big thing! 4) What makes your experiences unique and special for customers? Our focus is to offer people the chance not just to try a sport but to go on and practice it on a regular basis; whether that experience is sailing a yacht all the way to France, wake boarding every night after work or going to SUP race events. We try to remove as many of the barriers as we can so that the clients interest can be driven e.g. we provide everything including: equipment, storage space and a team of staff to help train and give advice. Our close team of staff is the spirit to the business and this passion easily translates to the customers. Our staff members enjoy meeting customers and are keen to share their knowledge with the customer and as keen to get out on the water with them. The venues also make a difference. We are very lucky to have such great venues and Hove Lagoon is one of the best centres in the UK to learn such a range of watersports. Whilst Brighton Marina gives us the opportunity to sail sight out of sea. 5) What’s your most frequently asked question from customers? It would probably be either ‘Do you provide wetsuits?’ Which we do! Or ‘what happens if it rains?’ As we are already getting wet, we do still run the activities. Watersports have that advantage of being great fun despite the weather; because you are active your body is able to stay warm. We also have a great café you can wind down in après Surf!